COUNTRY PLEASURES WITH TOWN SERVICES ON 12 ACRES – Acton - This truly remarkable property comes equipped with all the benefits of country living within city limits. 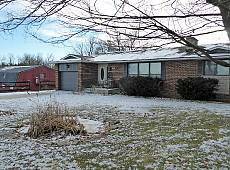 The 3+2 bdrm brick bungalow offers 2 kitchens & walk-out bsmt. The carpet-free main flr offers updated open concept, eat-in kitchen w/breakfast bar, stainless steel appl's, durable flring, formal living rm, laundry & access to attached garage. Enjoy a backyard oasis w/a 52 ft x 32 ft, 9-stall horse stable w/hay loft & playroom, 4 paddocks for grazing horses or organic gardens, koi stocked pond, mature forest & running track. A circular driveway leads to a lrg parking area for cars w/423 ft frontage on paved road. Walk to downtown shops & services.